Multiple Non-Essential Transition Metals Are Accumulated in Carotid Atherosclerotic Plaques: Missing Link in Atherosclerosis? 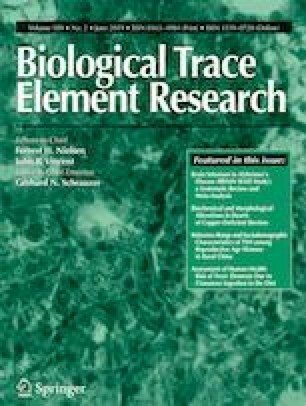 Population studies revealed that metal exposure through food, environment, and smoking was related with increased risk of cardiovascular disease. In this study, we determined complex chemical elements in surgical carotid endarterectomy specimens and carotid tissues from autopsies without atherosclerosis. Atherosclerotic plaques from 41 endarterectomies and normal carotid tissue from 30 autopsies were collected and elemental composition was determined by inductively coupled plasma optical emission spectrometry (ICP-OES) method. Eleven (26.8%) patients never smoked in carotid endarterectomy group. One patient was brass souvenir worker and one was goldsmith and others did not have direct contact with metals in the carotid endarterectomy group. Na, Cu, Mn, Bi, Co, Mo, Ni, Pb, Sb, Se, Sn, Ti, and W levels were not different between two groups. Bi, Co, Mo, Pb, Ti, and W were below the detection limit of ICP-OES in both groups. Concentrations of Mg, K, Ca, P, Fe, B, Zn, Al, As, Cr, Pt, and Hg were significantly higher in carotid endarterectomies than normal carotid tissue samples. Cd and S values were significantly higher in autopsy samples. There is significant multiple non-essential transition metal accumulation in atherosclerotic carotid endarterectomy plaques. The cardiovascular consequences of metal toxicity have not been researched adequately due to large emphasis on the role of cholesterol in atherosclerosis. High level of non-essential transition metal elements in the carotid atherosclerotic plaques may add the missing link of atherogenesis and may necessitate new treatment and prevention strategies in carotid disease if confirmed by further research. Some parts of this article were presented as poster in 86th European Atherosclerosis Congres, May, 2018 Lisbon, Portugal. We thank Gamze Karacan and Ufuk Yetik for their valuable efforts in sample transport and conservation. This study was financed by the authors’ own resources. The study was carried out in accordance with the Declaration of Helsinki and protocol was reviewed and approved by the Ethics Committee of İstanbul Aydin University (2018-15).